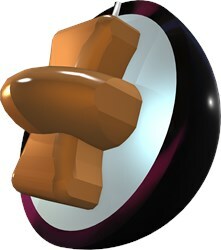 The Track Spare + is different than most spare bowling balls. This ball contains a performance core that will help pick up spares but will also help with strikes when you need a straighter ball. The single density i-Core offers large flare potential and with the asymmetric core it provides more hitting power than the usual plastic spare ball. The Spare + not only looks good on the lane but performs like no other spare ball. If you are looking for a good plastic spare ball - particularly if you throw straight at all your spare shots - or even if you need a ball that can strike on really dry/hard lanes - the new Track Spare+ may be the ball for you. In the past couple years, players have been "going retro" with urethane - and even plastic - to get the job done. This plastic ball has a leg-up on the rest by having a very asymmetrical core that will give your ball some extra punch through double woods and buckets on spare shots, as well as some hitting power in the pocket. I have used the Spare+ as a strike ball (with surface) on 32' Wolf pattern and was not disappointed. If you are in the market for a spare ball - why not get one that looks great - and provides some versatility? I recommend the Track Spare+. This spare ball is my favorite ball in the bag. We all know we can strike. Sometimes we don't strike as much as we'd like. For that reason, this ball is a must in your bag. This spare ball not only has some great looking colors but also will help improve your average, by picking up more spares throughout the night of league or tournament play. It just may be the difference between you finishing first or second and taking home more money from your league or that weekend tournament. 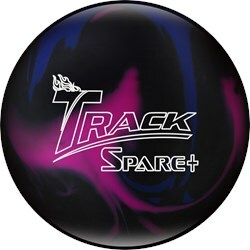 Due to the time it takes to produce the Track Spare + Purple/Blue/Black ball it will ship in immediately. We cannot ship this ball outside the United States.